Thank you for your interest in contacting Lama Zopa Rinpoche. We hope the below information will assist you in directing your inquiry to the appropriate department or help you access the resources you need. 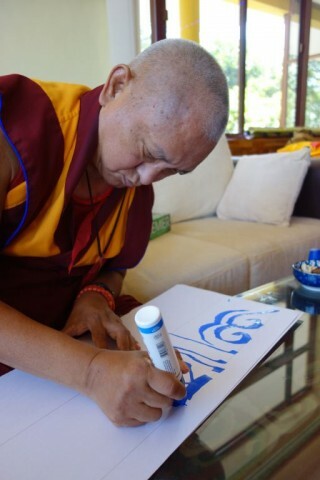 Lama Zopa Rinpoche writing mantras to go above a rabbit house located at Sera Je Monastery, India. Photo by Ven. Roger Kunsang, December, 2013. For questions related to FPMT centers, projects and services please visit the Center FAQ page or contact the Center Services Director. You may view Rinpoche’s most up-to-date schedule and subscribe to his schedule via RSS feed for the most current information. In order to request prayers for someone who is sick please email and mention the sick person’s full name. The Sangha at Rinpoche’s house will dedicate for them during regular animal liberations and daily when making long life tsa tsas. If you would like to make a donation for this service please go to the Animal Liberation Fund and Stupa Fund. If you would like to request a puja for a sick person, Kopan Monastery offer this service. Lama Zopa Rinpoche’s essential advice and practices for the time of death. To request prayers from His Holiness the Dalai Lama, Lama Zopa Rinpoche and FPMT Sangha communities Request Prayers for the Dead. Lama Zopa Rinpoche’s Essential Daily Practice Advice is a valuable resource Rinpoche has put togther to use a basis for daily practice. The International Mahayana Institute (IMI), FPMT’s community of monks and nuns, has detailed guidelines and next steps regarding how to prepare for ordination. Lama Zopa Rinpoche’s Online Advice book contains answers to many students’ questions about health, life problems, practice, and more. This page includes current advice from Rinpoche and everything you need to know about essential practices to protect from harm, help during sickness and assist those who are dying or have died. Due to Rinpoche’s health and very busy schedule it is not always possible for Rinpoche to reply to all letters, it also can take some months before Rinpoche has the time. Before sending your question, please do have a look at Rinpoche’s Online Advice Book as Rinpoche may have answered a question very similar to yours before.